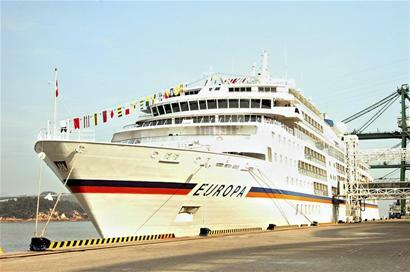 On 8:00a.m Thursday morning, "Europa", the Hapag-Lloyd‘s luxury cruise liner berthed at Sanya Phoenix International Cruise Terminal with more than 350 passengers from 19 countries on board. It is the last world-class cruise liner that called at Sanya port in 2010, reports sanya.hinews.cn. 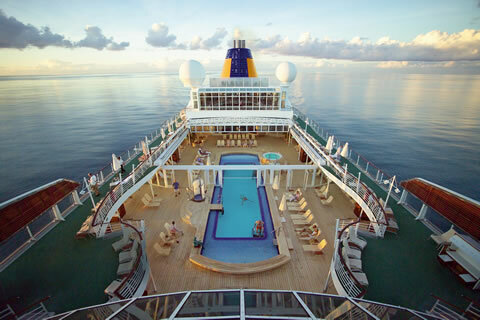 “Europa” has been rated as world’s top luxury cruise liner by Cruise Lines International Association for 6 consecutive years. The “Europa” is 198.6 meters in length and 24 meters in width. The cruise ship has 204 luxury suites with maximum passenger capacity of 408. Dubbed as a “floating 5-star hotel”, the cruise liner, with elegant European style decoration, provides passengers with a series of advanced equipment and modern facilities, including a library, jewelry and clothing stores, medical rooms and a kindergarten. The passengers on the cruise ship are mainly from Germany. It stayed at Sanya port for 10 hours and left at 6 pm the same day for Xialong Bay, Vietnam. According to industry insiders, with the recovery of world’s economy and the increasing influence of Hainan International Tourism Island, there will be an increasing number of world-class cruise liners choosing to call at Sanya Port in 2011, which is expected to greatly promote Sanya’s cruise liner market.